Out of the blue, the third Android O Developer Preview hit earlier than expected last night, bringing us one step closer to the official release, with only a single developer preview left before the stable version finally touches down. As such, this release consists primarily of stability improvements, but with a couple of new features added to sweeten the deal. Notifications have once again received a slight revamp in the latest Developer Preview. 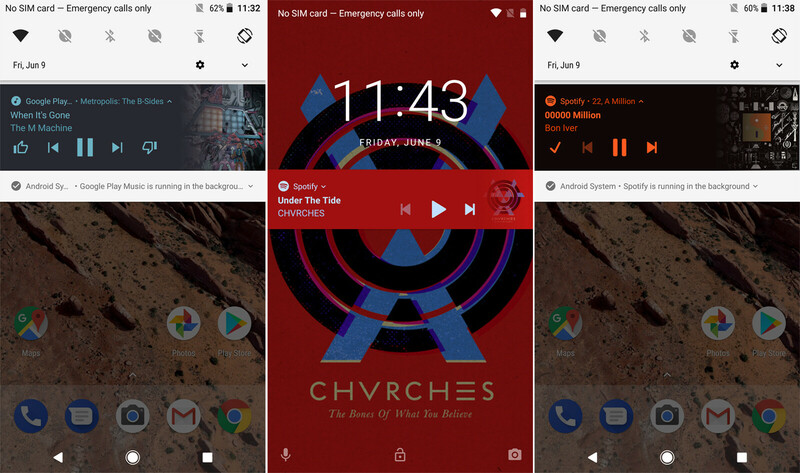 Firstly, there's a fun new layout for media notifications (think music and videos). If it contains an embedded image, the notification now automatically shifts to a relevant color scheme, with the background gradually fading into the picture to its right. Overall, the effect is sweet, though it could be a bit too busy for some people. Also, the Android System now automatically displays a persistent notification whenever an app is running in the background. But since this could quickly become annoying, Google lets you easily disable the feature via the newly-introduced notification channels. The dreadful "Cylinder" icon shape introduced in the last preview has officially been killed off in favor of the slightly more tasteful "Teardrop" option, reminiscent of the current Allo and Duo icons. Also, a year-old meme has accidentally become reality, thanks to a couple of Google's own apps exhibiting the interesting behavior of putting the app icon inside a circle which itself is inside the user-chosen shape. This is, of course, just a bug, but it's a fun one nonetheless. Hey, remember the theming engine that made a surprise appearance in the last developer preview? Well, in classic Google tradition, it has been removed (probably because it never actually worked at all), though there's still a slim chance it will make its way to the official release. Also, the hidden System UI Tuner menu got gutted as well, losing the ability to change the on-screen button layout and the lock screen shortcuts. Surprising no one, Android O is now officially version number 8.0, according to the About screen in the Settings menu. Also, Developer Preview 3 is the point at which Google has officially finalized all the APIs, and apps targeting the new version of the OS should start becoming available in the Play Store in the near future. As you can see, things are going pretty much according to plan, so the next Android O preview will almost surely be the last before the final release. We should also find out what exactly the latest version will be called soon enough – Android 7.0 was officially revealed to be called Nougat on June 30 last year, more than a month ahead of its stable release. Still, it's worth noting that even if the changes in this release may seem minor, the overall performance has thus far been stellar. This is in contrast with Developer Preview 2, whose users often reported suffering from slowdowns and stutter. Also, a number of bugs have been squashed between releases (though, of course, new ones have been introduced as well – this is a beta version after all). If you want to test out the Android O Developer Preview, and are also aware of the risks of installing pre-release software on your device, Google has provided a helpful guide on how to do so, which can be found here. You should hire this guy....he will right some good entertaining articles. That was the perfect pun from Peter K. He knows Greenman! i found the O Preview nice on my Nexus 5X until i reset it to see how it works if freshly installed... well...bootloop called this an abrupt end and therefore i couldn't install the third preview. LG should be ashamed.